Synopses of Das Rheingold, Die Walküre, Siegfried, and Götterdämmerung—the four epic operas that make up Richard Wagner’s Ring cycle. Courtesy of The Metropolitan Opera. In mythical times. In the depths of the Rhine, the Rhinemaidens Woglinde, Flosshilde, and Wellgunde laugh and play as they swim. Their singing attracts the dwarf Alberich, who clumsily tries to catch them, to their amusement. Suddenly a beam of sunlight falls into the water, creating a golden glow. The Rhinemaidens joyfully swim around it while Alberich, dazzled by the sight, asks them what it is. The girls tell him about the Rhinegold, a treasure of immeasurable value, and explain that whoever wins it will gain power over the world, but to do so he must renounce love. Frustrated by his unsuccessful attempts to catch one of the girls, the ugly dwarf curses love and steals the gold. A monochrome photograph taken of Joseph Hoffman, 1876. Public Domain. High on a mountain, Fricka, the goddess of marriage, wakes her husband, Wotan, lord of the gods. Delighted, he looks at their newly built castle visible in the distance, but Fricka reproaches him: Wotan has promised her sister Freia, goddess of youth, to the giants Fasolt and Fafner in return for building the fortress. Suddenly Freia runs in, pursued by the giants, who demand payment. Wotan manages to hold them back with the help of the gods Donner and Froh, Freia’s brothers, who rush in to help. Finally Loge, the demi-god of fire, appears. He cleverly suggests an alternative payment: the ring that Alberich has forged from the Rhinegold and all the other treasures he has accumulated. The giants agree, dragging Freia off as hostage. With the youth goddess gone, the gods suddenly begin to age. Wotan and Loge hurry down through the earth to find Alberich. In Nibelheim, the underground home of the Nibelungs, Alberich forces his timid brother Mime to give him the Tarnhelm, a magic helmet Mime has made that transforms its wearer into any shape and that can carry him anywhere in a second. Alberich tries it on, turns invisible and torments Mime before going off to terrorize the other dwarfs whom he has enslaved to work for him. Wotan and Loge arrive, and Mime tells them about Alberich’s cruel dictatorship. Reappearing, Alberich mocks the gods and threatens to conquer the world and enslave them. Loge asks for a demonstration of the Tarnhelm and Alberich obliges, turning himself first into a huge serpent, then into a toad, which the gods capture easily. Loge snatches the Tarnhelm, and as Alberich resumes his old form they bind him and drag him off. Back on the mountain, Alberich is forced to summon the Nibelungs to heap up the gold for Freia’s ransom. Loge keeps the Tarnhelm—and Wotan wants the ring. Alberich says he would rather die than give it up, but Wotan wrests it from his finger, suddenly overcome with lust for its power. Alberich is shattered. Freed and powerless, he curses the ring: ceaseless worry and death shall be the destiny of all who possess it. After the dwarf has left, Fricka, Donner, and Froh welcome back Wotan and Loge, who show them the pile of gold. The giants return with Freia. Fasolt, who loves the girl, agrees to accept the gold if it completely hides her from his view. Froh and Loge pile up the treasure and even give up the Tarnhelm, but Fasolt can still see Freia’s eye through a crack. Fafner demands the Ring to close it. When Wotan refuses, the giants start to carry Freia off. They are stopped by the sudden appearance of Erda, goddess of the earth, who warns Wotan that possession of the ring will bring about the end of the gods. Wotan wants to know more and tries to question her, but she vanishes. He decides to follow her advice and throws the ring on the hoard. Alberich’s curse immediately claims its first victim as Fafner kills his brother in a dispute over the ring. The gods are horrified. Donner clears the air with thunder and lightning and a rainbow appears, forming a bridge to the castle which Wotan names Valhalla. As the voices of the Rhinemaidens echo from the valley below, lamenting the loss of the Rhinegold, the gods proudly walk toward their new home. Pursued by enemies during a snowstorm, Siegmund stumbles exhausted into an unfamiliar house. Sieglinde finds him lying by the hearth, and the two feel an immediate attraction. They are interrupted by Sieglinde’s husband, Hunding, who asks the stranger who he is. Calling himself “Woeful,” Siegmund tells of a disaster-filled life, only to learn that Hunding is a kinsman of his enemies. Hunding tells his guest they will fight to the death in the morning. Alone, Siegmund calls on his father, Wälse—who is in fact Wotan, leader of the gods, in human disguise—for the sword he once promised him. Sieglinde reappears, having given Hunding a sleeping potion. She tells of her wedding, at which a one-eyed stranger thrust into a tree a sword that has since resisted every effort to pull it out. Sieglinde confesses her unhappiness to Siegmund. He embraces her and promises to free her from her forced marriage to Hunding. As moonlight floods the room, Siegmund compares their feelings to the marriage of love and spring. Sieglinde addresses him as “Spring” but asks if his father was really “Wolf,” as he said earlier. When Siegmund gives his father’s name as Wälse instead, Sieglinde recognizes him as her twin brother. Siegmund pulls the sword from the tree and claims Sieglinde as his bride, rejoicing in the union of the Wälsungs. Art title page for Schott’s vocal score of Wagner’s opera Die Walküre, 1899. Public Domain. High in the mountains, Wotan tells his warrior daughter, the Valkyrie Brünnhilde, that she must defend his mortal son Siegmund in his upcoming battle with Hunding. She leaves joyfully to do what he has asked, as Fricka, Wotan’s wife and the goddess of marriage, appears. Fricka insists that Wotan must defend Hunding’s marriage rights against Siegmund. She ignores his argument that Siegmund could save the gods by winning back the Nibelung Alberich’s all-powerful ring from the dragon Fafner. When Wotan realizes he is caught in his own trap—he will lose his power if he does not enforce the law—he submits to his wife’s demands. After Fricka has left, the frustrated god tells the returning Brünnhilde about the theft of the Rhinegold and Alberich’s curse on it. Brünnhilde is shocked to hear her father, his plans in ruins, order her to fight for Hunding. Siegmund comforts his fearful bride and watches over her when she falls asleep. Brünnhilde appears to him as if in a vision, telling him he will soon die and go to Valhalla. He replies that he will not leave Sieglinde and threatens to kill himself and his bride if his sword has no power against Hunding. Moved by his steadfastness, Brünnhilde decides to defy Wotan and help Siegmund. Siegmund bids farewell to Sieglinde when he hears the approaching Hunding’s challenge. The two men fight and Siegmund is about to be victorious, when Wotan appears and shatters Siegmund’s sword, leaving him to be killed by Hunding. Brünnhilde escapes with Sieglinde and the broken weapon. Wotan contemptuously kills Hunding with a wave of his hand and leaves to punish Brünnhilde for her disobedience. Brünnhilde’s eight warrior sisters have gathered on their mountaintop, bearing slain heroes to Valhalla. They are surprised to see Brünnhilde arrive with a woman, Sieglinde. When they hear she is fleeing Wotan’s wrath, they are afraid to hide her. Sieglinde is numb with despair until Brünnhilde tells her she bears Siegmund’s child. Now eager to be saved, she takes the pieces of the sword from Brünnhilde, thanks her, and rushes off into the forest to hide from Wotan. When the god appears, he sentences Brünnhilde to become a mortal woman, silencing her sisters’ objections by threatening to do the same to them. Left alone with her father, Brünnhilde pleads that in disobeying his orders she was really doing what he wished. Wotan will not give in: she must lie in sleep, a prize for any man who finds her. She asks to be surrounded in sleep by a wall of fire that only the bravest hero can pierce. Both sense this hero must be the child that Sieglinde will bear. Sadly renouncing his daughter, Wotan kisses Brünnhilde’s eyes with sleep and mortality before summoning Loge, the god of fire, to encircle the rock. As flames spring up, the departing Wotan invokes a spell defying anyone who fears his spear to brave the flames. In his cave in the forest, the dwarf Mime forges a sword for his foster son Siegfried. He hates Siegfried but hopes that the boy will kill the dragon Fafner, who guards the Nibelungs’ treasure, so that Mime can take the all-powerful ring from it. Siegfried arrives and smashes the new sword, raging at Mime’s incompetence. Having realized that he can’t be the dwarf’s son, as there is no physical resemblance between them, he demands to know who his parents were. For the first time, Mime tells Siegfried how he found his mother, Sieglinde, in the woods, who died giving birth to him. When he shows Siegfried the fragments of his father’s sword, Nothung, Siegfried orders Mime to repair it for him and rushes out. As Mime sinks down in despair, a stranger enters. It is Wotan, lord of the gods, in human disguise as the Wanderer. He challenges the fearful Mime to a riddle competition, in which the loser forfeits his head. The Wanderer easily answers Mime’s three questions about the Nibelungs, the giants, and the gods. Mime in turn knows the answers to the traveler’s first two questions but gives up in terror when asked who will repair the sword Nothung. The Wanderer admonishes Mime for enquiring about faraway matters when he knows nothing about what closely concerns him. Then he departs, leaving the dwarf’s head to “him who knows no fear” and who will re-forge the magic blade. When Siegfried returns demanding his father’s sword, Mime tells him that he can’t repair it. He vainly tries to explain the concept of fear to the boy and, in order to teach him, proposes a visit to Fafner’s cave. Siegfried agrees and enthusiastically begins to forge the sword himself. While he works, Mime prepares a sleeping potion to give to Siegfried once he has killed Fafner. Flashing the finished sword, Siegfried smashes the anvil in half and runs off into the forest. The same night, Mime’s brother Alberich is hiding by the entrance to Fafner’s cave, obsessed with winning back the ring for himself. The Wanderer enters and tells the Nibelung to watch out for Mime. He then wakes Fafner and warns him that a young hero is on his way to kill him. Unimpressed, the dragon goes back to sleep. 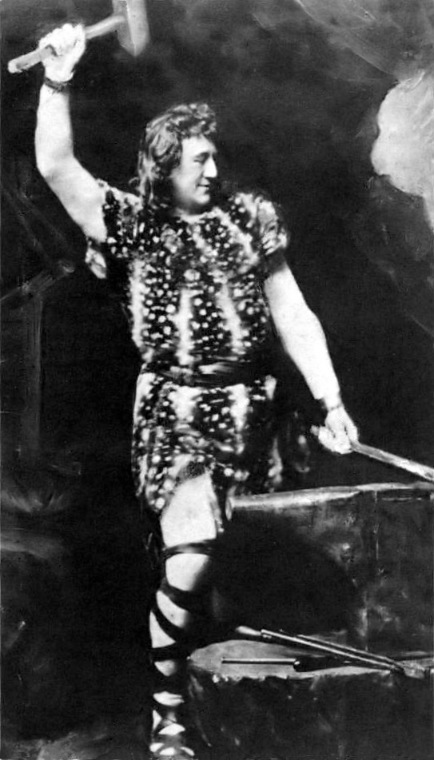 Heinrich Gudehus as Siegfried. Public Domain. As dawn breaks, Mime and Siegfried arrive. Caught up in the peaceful beauty of the woods, Siegfried thinks about his parents. He tries to imitate the song of a bird on a reed pipe but fails and blows his horn instead. This awakens Fafner, and in the ensuing fight Siegfried kills the dragon. With his dying words, Fafner warns the boy of the destructive power of the treasure. When Siegfried accidentally touches a drop of Fafner’s blood to his lips, he suddenly understands the singing of the bird, which directs him to the gold in the cave. Alberich and Mime appear quarreling but withdraw as Siegfried returns with the ring and the Tarnhelm. The bird warns Siegfried not to trust Mime, and when the dwarf offers him the potion, Siegfried kills him. The bird then tells Siegfried of a beautiful woman named Brünnhilde, asleep on a mountain surrounded by fire. He sets out to find her. High on a mountain pass, the Wanderer summons Erda, goddess of the Earth, to learn the gods’ fate. She evades his questions, and he resigns himself to the impending end of the gods’ reign. His hope now rests with Brünnhilde and Siegfried. When Siegfried approaches, making fun of the god whom he takes for a simple old man, the Wanderer attempts to block his path. With a stroke of his sword, Siegfried shatters the Wanderer’s spear—the same spear that smashed Nothung to pieces years before. Defeated, the Wanderer retreats. 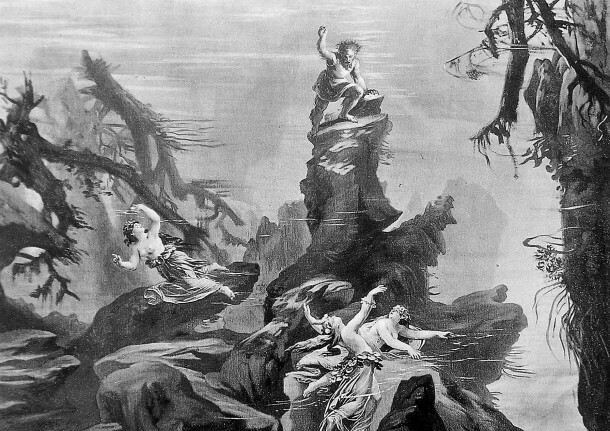 Siegfried reaches the mountaintop where Brünnhilde sleeps. Never having seen a woman before, he thinks he has discovered a man. When he removes Brünnhilde’s armor, he is overwhelmed by the sight of her beauty and finally realizes the meaning of fear. Mastering his emotions, he awakens her with a kiss. Hailing the daylight, Brünnhilde is overjoyed to learn that it is Siegfried who has brought her back to life. She tries to resist his declarations of passion, realizing that earthly love must end her immortal life, but finally gives in and joins Siegfried in praise of love. At night on the Valkyries’ rock, the three Norns, daughters of Erda, weave the rope of destiny. They tell how Wotan ordered the world ash tree, from which his spear was once cut, to be felled and its wood piled around Valhalla. The burning of the pyre will mark the end of the old order. Suddenly the rope breaks. Their wisdom ended, the Norns descend into the earth. Dawn breaks and Siegfried and Brünnhilde emerge. Having cast protective spells on him, she sends him into the world to do heroic deeds. As a pledge of his love, Siegfried gives her the ring he took from the dragon Fafner, and she offers her horse, Grane, in return. Siegfried sets off on his travels. In the hall of the Gibichungs on the banks of the Rhine, Hagen advises his half-siblings, Gunther and Gutrune, to strengthen their rule through marriage. 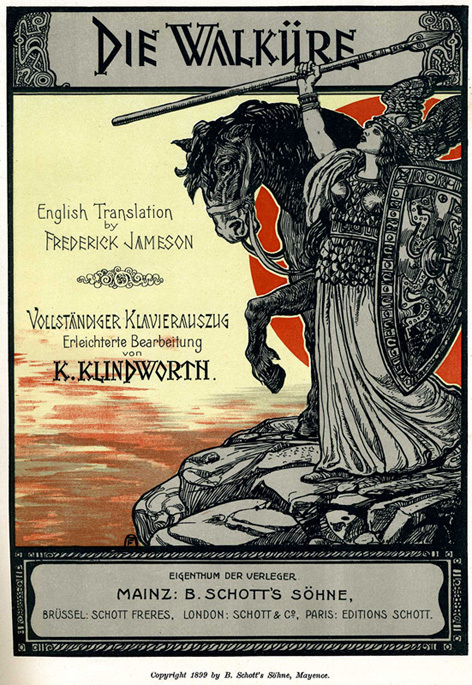 He suggests Brünnhilde as Gunther’s bride and Siegfried as Gutrune’s husband. Since only the strongest hero can pass through the fire on Brünnhilde’s rock, Hagen proposes a plan: a potion will make Siegfried forget Brünnhilde and fall in love with Gutrune. To win her, he will claim Brünnhilde for Gunther. When Siegfried’s horn is heard from the river, Hagen calls him ashore. Gutrune offers him the potion. Siegfried drinks and immediately confesses his love for her. When Gunther describes the perils of winning his chosen bride, Siegfried offers to use the Tarnhelm to transform himself into Gunther. The two men take an oath of blood brotherhood and set out on their quest. 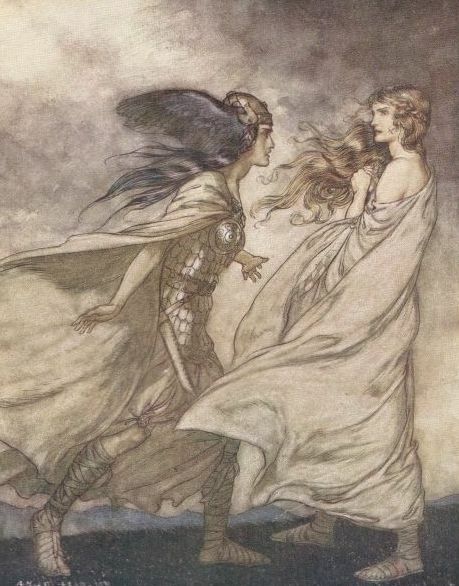 Brünnhilde is visited by her Valkyrie sister Waltraute by Arthur Rackham, 1912. Public Domain. Waltraute, horrified by the impending destruction of Valhalla, comes to Brünnhilde’s rock, pleading with her sister to return the ring to the Rhinemaidens, its rightful owners, to save the gods. Brünnhilde refuses, declaring she could never part with Siegfried’s gift. Waltraute leaves in despair. Hearing Siegfried’s horn in the distance, Brünnhilde is overjoyed but becomes terrified when a stranger appears before her, claiming her as Gunther’s bride and tearing the ring from her hand. Outside the Gibichungs’ hall at night, Hagen’s father, Alberich, appears to his son as if in a dream and reminds him to win back the ring. Dawn breaks and Siegfried arrives. Hagen summons the Gibichungs to welcome Gunther, who enters with the humiliated Brünnhilde. When she sees Siegfried, she furiously denounces him, but he, still under the spell of the potion, doesn’t understand her anger. Noticing the ring on Siegfried’s finger, Brünnhilde demands to know who gave it to him, since it was taken from her, supposedly by Gunther, just the night before. She accuses Siegfried of having stolen the ring and declares that he is her husband. Siegfried protests, swearing on Hagen’s spear that he has done no wrong. Brünnhilde now only wants vengeance. Hagen offers to kill Siegfried, but she explains that she has protected his body with magic—except for his back, which she knows he would never turn to an enemy. Gunther hesitatingly joins the conspiracy of murder. 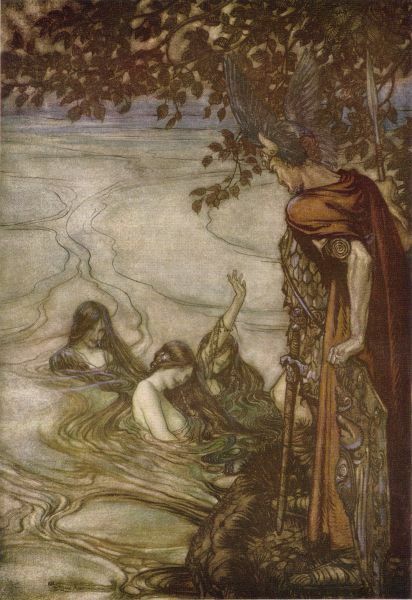 The Rhinemaidens warn Siegfried by Arthur Rackham,1912. Public Domain. Siegfried, separated from his hunting party, meets the three Rhinemaidens by the banks of the river. They ask him to return the ring to them but he refuses to prove he doesn’t fear its curse. The Rhinemaidens predict his imminent death and disappear as Hagen, Gunther, and the other hunters arrive. Encouraged by Hagen, Siegfried tells of his youth and his life with Mime, the forging of the sword Nothung, and his fight with the dragon. While he is talking, Hagen makes him drink an antidote to the potion. His memory restored, Siegfried describes how he walked through the fire and woke Brünnhilde. At this, Hagen stabs him in the back with the spear on which Siegfried had sworn. When Gunther expresses his shock, Hagen claims that he avenged a false oath. Siegfried remembers Brünnhilde with his last words and dies. Back at the hall, Gutrune wonders what has happened to Siegfried. When his body is brought in, she accuses Gunther of murder, who replies that Hagen is to blame. The two men fight about the ring and Gunther is killed. As Hagen reaches for the ring, the dead Siegfried threateningly raises his arm. Brünnhilde enters and calmly orders a funeral pyre to be built on the banks of the Rhine. She denounces the gods for their guilt in Siegfried’s death, takes the ring from his hand and promises it to the Rhinemaidens. Then she lights the pyre and leaps into the flames. The river overflows its banks and destroys the hall. Hagen, trying to get to the ring, is dragged into the water by the Rhinemaidens, who joyfully reclaim their gold. In the distance, Valhalla and the gods are seen engulfed in flames.